At Thomas A. Caserta, we manufacture rubber bushings to precise specifications with quick turnarounds. We work with clients to determine their desired bushings’ size, shape, and composite materials, and then we machine the bushings to tight tolerances. 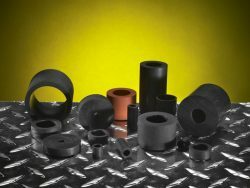 We can construct rubber bushings from many different materials, and we build them using an array of processes that emphasize accuracy and repeatability. With over 50 years of experience manufacturing rubber bushings, our talented staff looks forward to help you tackle your next project. We strive to provide our clients with quality service that meets or exceeds your expectations. If you would like to learn more about our rubber bushings or our other products, contact us today.